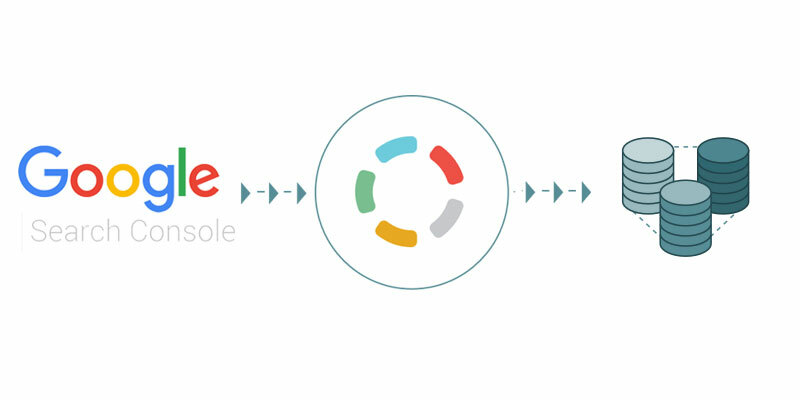 This integration will allow you to connect with Google Search Console and start collecting your data. It is a matter of minutes to send your shipments data to feed your BI, your data warehouse, or your custom analytics stack. In order to connect Google Search Console with Blendo, you should verify that you are verified owner of the sites and have Owner or Full User permissions for your Google Search Console account. 1. To add this integration, go to Blendo dashboard. Click Add a Source and click on Google Search Console. 2. Click on the Google Search Console icon. 3. Next, you will be prompted to choose a Google account to log into and to approve Blendo’s access to your Google Search Console data. Blendo will only ever read your data. 4. Click Allow to continue. 5. 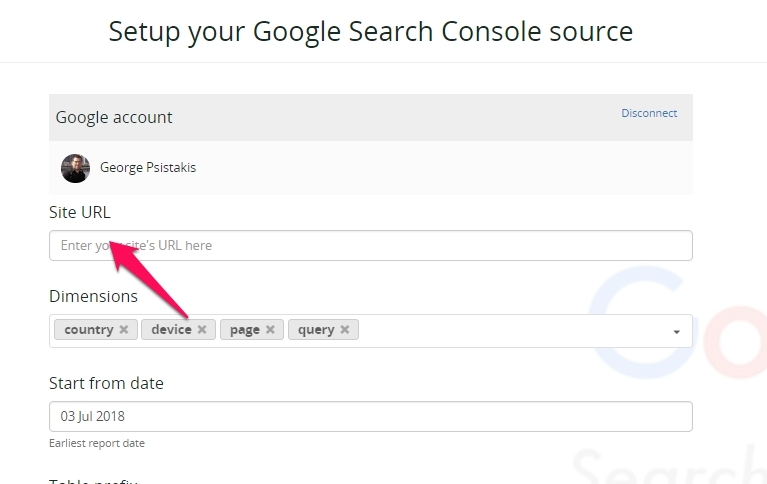 In the new Setup your Google Search Console source screen, type the URL of the page you want to the info from. Please make sure to use the exact URL as found inside Google Search Console. 6. Now we need to select the Dimensions for the report we want to replicate to your destination database. In the Dimensions field, you can see the list of dimensions available for selection. You may use the autocomplete search or use the drop-down to explore it. Valid Combinations: Not all Dimensions can be queried together. The available dimensions are Queries, Pages, Countries, Devices and Search Type. Please note that currently is not possible to combine the Search Type dimension with other dimensions and therefore should be on its own in a report. Metrics: The metrics will always be the following: clicks, impressions, ctr, position. From Google Search Console API we can pull data up to 90 days in the past and as recent as 3 days ago (Google Search console documentation here) because of the retention policy of Google. So it is important to have that in mind along with the fact that the most recent data that you will get will be 3 days old. In the Site URL please make sure to use the exact URL of the site as depicted inside Google Search Console. Each site URL corresponds to one pipeline and one table with a report. The Dimensions and Metrics combination can’t change after the pipeline integration is saved. The primary key Blendo creates depends on your choices during the original setup. 7. As written above Google Search Console API we can pull data up to 90 days in the past and as recent as 3 days ago because of the retention policy of Google. So the default address will be that maximum. 8. Add a Table Prefix if you want. 10. Review again your selections. Once saved, you cannot add or remove dimensions or metrics. Click Validate & Save. This configuration controls how often Blendo will pull data from your Google Search Console integration. Loading to your data warehouse could take a little bit longer. 11. If you want to change the replication schedule go to the Schedule section and click on Reschedule. When Blendo first connects to Google Search Console Data source, will schedule an initial sync job. That will include the historical data and may take some time to complete. Due to Google’s retention policy, Google Search Console API allows us to pull data up to 90 days in the past and as recent as 3 days ago. Blendo syncs Google Search Console data based on the schedule and frequency you choose. The default setting is every 1 hour but is configurable from inside the app. Due to Google’s retention policy, and the way Google Search Console API allows us to pull data you will be able to see daily data. The first time Blendo syncs your Google Search Console data performs a full replication. Then your Google Search Console data is replicated incrementally. Note that Blendo will only read your data. After you finish the integration with Google Search Console, you might see its status as Importing from source, Exporting to the destination, or Completed. What Google Search Console data do I have available? Blendo creates a table for each Google Search Console integration you create. The schema of the table will have the Dimensions, Metrics, and date as columns. the table will have country, page, device, query, impressions, clicks, position, ctr, date as columns. As Google Search Console does not provide a primary key that can be used for deduplication, the primary key is blendo_id. This is composed by using the dimension columns plus the date. Google Search Console data fetched on a daily basis. Every sync will pull the report for the current day.